Greater Western Sydney won 159 more disposals (459300) than Gold Coast. Since Gold Coast entered the competition in 2011, this discrepancy in disposals of this magnitude has only occurred on ten previous occasions. 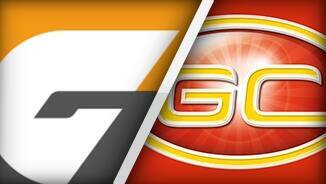 Greater Western Sydney has defeated Gold Coast by 66 points, the greatest winning margin in the Giants' history. Greater Western Sydney now leads Gold Coast by 71 points. 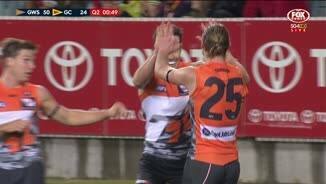 The Giants greatest win in the AFL is by 64 points, against Melbourne in Round 21 2014. 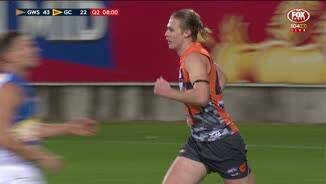 GWS Giants InterchangeRhys Palmer off due to an injury. Giants InterchangeRhys Palmer and is possibly out for the game. Cam McCarthy has now kicked 5.1 tonight, which means his first five career matches he has kicked 14.4. 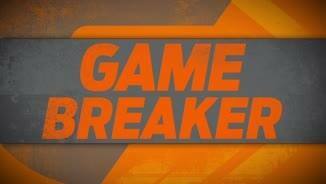 GWS Giants InterchangeNathan Wilson off due to an injury. 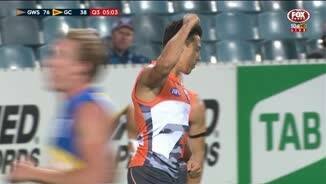 Dylan Shiel has been a dynamo in the GWS midfield from the first minute. He has won 34 disposals (a personal best), five clearances, four inside 50s, 11 score involvements including kicking one goal and two behinds. Phil Davis has been a rock in the back line for Greater Western Sydney, winning 12 intercept possessions with four of them intercept marks. From his 18 disposals, he has been involved in eight score chains. Greater Western Sydney has now recorded 31 scoring shots (12.19), which is the most the Giants have recorded in a match. 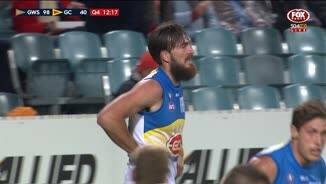 Gold Coast Suns InterchangeMatt Shaw was substituted into the game for Jack Martin. Greater Western Sydney has registered 110 more disposals then Gold Coast to threequarter time. The Giants previous highest disposal differential in comparison to its opponent to the last change was 60 more than Collingwood, in Round 22 2014. After kicking 4.10 that quarter, Greater Western Sydney takes a 52point lead into the last change. This is the Giants' biggest ever advantage at three-quarter time, surpassing the 44-point lead against Melbourne (67-23) in Round 21 2014. Giants InterchangeDevon Smith off due to an injury. Suns InterchangeJack Martin off due to an injury. Welcome to Manuka Oval for the GWS Giants v Gold Coast Suns Round 4 clash. 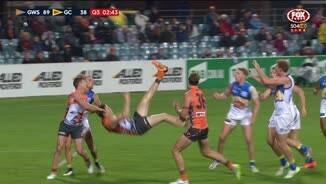 GREATER Western Sydney’s star forwards have combined to steer the Giants to a record-breaking 66-point victory at StarTrack Oval on Saturday night. The Giants eclipsed their greatest winning margin of 64 points against Melbourne in round 21 last season, beating the Suns 16.23 (119) to 7.11 (53). Young forward Cam McCarthy starred for GWS with five goals while partner-in-crime Jeremy Cameron slotted four and should have had more. The 2013 All Australian finished with 4.6. The pair benefited from a dominant midfield led by Dylan Shiel, who had a game-high 39 touches, Tom Scully, Ryan Griffen and Callan Ward. 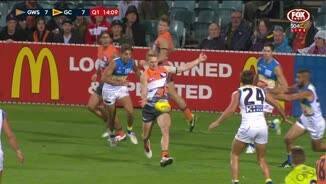 The Suns were totally outclassed after the first ten minutes, and if not for the Giants’ poor finishing in front of goal, the margin could have reached three figures. 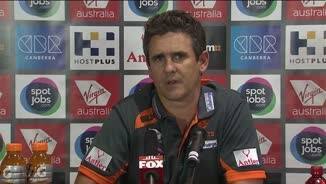 The third term was particularly wasteful from the Giants; they booted 4.10 for the quarter with Cameron among the culprits, but coach Leon Cameron said although his side’s finishing was disappointing, he was happy with the effort of his two key forwards. "I thought that was Jeremy’s best four-quarter performance. The challenge Jeremy has in his football is to get that 15 to 18 possessions every game, not just rely on six or seven and try and hit the scoreboard," Cameron said post-match. "There’s no doubt Cam McCarthy has come on in leaps and bounds in his first four real games of AFL. His workrate is the most pleasing thing, for a 19-year-old kid to kick five goals is just terrific." GWS ruckman Shane Mumford monstered his Gold Coast counterparts Tom Nicholls – who was a late inclusion – and Zac Smith, while defenders Nick Haynes, Joel Patfull and Phil Davis, were strong for the winners. Gold Coast kicked the opening goal in each of the first three quarters but had trouble countering the Giants’ superb brand of running football. GWS kicked four goals in a row in the opening term, and repeated the feat in the second and third quarters. Dion Prestia and Michael Rischitelli tried hard for Gold Coast and won plenty of possessions; but it mattered little against the confident Giants, who had more players willing to work hard across all parts of the ground. The Suns showed a lack of defensive effort for large parts of the match after a promising start, a trend that would have coach Rodney Eade frustrated. The concerns are very real for Eade, just two-and-a-half years after club chairman John Witheriff declared the Suns would win a flag by the end of 2015. "This was a bit of a setback today, a bit of a shock. 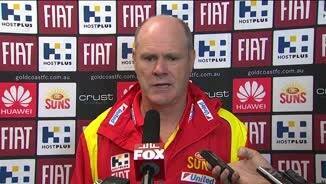 I thought the resilience at times could be questioned," Eade said. "Guys tried, but in the last half of quarters we seemed to fatigue, seemed to lose concentration. "In the transition run, they’re as good as anyone at that, they’ve got some really elite runners in their team, and are certainly the best side we’ve played so far. It’s only four games in but they’ve got a really bright future." Eade believes unlike GWS, who have added older players such as defenders Heath Shaw and Joel Patfull in the past two years, his young side lacks leadership; especially with captain Gary Ablett missing. “We’re working hard on that, we’re trying to develop that as quickly as we can. But getting some players who have played 100-150 games certainly helps the younger players,” Eade said. The club will finish round four anchored to the bottom of the ladder alongside cross-town rivals the Brisbane Lions. Joel Patfull fends off Brandon Matera on Saturday night in Canberra. Picture: AFL Media.